Unions such as the Progressive Farmers represented a threat not only to the tenet of white supremacy but also to the basic concepts of capitalism. Although the United States was on the winning side of World War I, supporters of American capitalism found in communism a new menace to their security. With the success of the Russian Revolution, stopping the spread of international communism was seen as the duty of all loyal Americans. Arkansas governor Charles Hillman Brough told a St. Louis, Missouri, audience during the war that “there existed no twilight zone in American patriotism” and called Wisconsin senator Robert LaFollete, who opposed the war, a Bolshevik leader. The threat of “Bolshevism” seemed to be everywhere: not only in the labor strikes led by the radical Industrial Workers of the World but also in the cotton fields of Arkansas. After troops arrived in Elaine on the morning of October 2, 1919, the white mobs began to depart the area and return to their homes. The military placed several hundred African Americans in makeshift stockades until they could be questioned and vouched for by their white employers. Within days of the initial shoot-out, 285 African Americans were taken from the temporary stockades to the jail in Helena, the county seat, although the jail had space for only forty-eight. Two white members of the Phillips County posse, T. K. Jones and H. F. Smiddy, stated in sworn affidavits in 1921 that they committed acts of torture at the Phillips County jail and named others who had also participated in the torture. 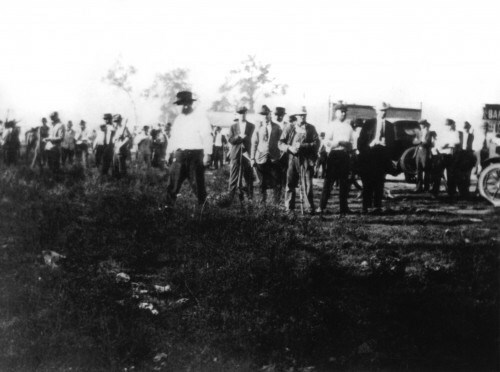 On October 31, 1919, the Phillips County grand jury charged 122 African Americans with crimes stemming from the racial disturbances. The charges ranged from murder to nightriding, a charge akin to terroristic threatening. The trials began the next week. White attorneys from Helena were appointed by Circuit Judge J. M. Jackson to represent the first twelve black men to go to trial. Attorney Jacob Fink, who was appointed to represent Frank Hicks, admitted to the jury that he had not interviewed any witnesses. He made no motion for a change of venue, nor did he challenge a single prospective juror, taking the first twelve called. By November 5, 1919, the first twelve black men given trials had been convicted of murder and sentenced to die in the electric chair. As a result, sixty-five others quickly entered plea-bargains and accepted sentences of up to twenty-one years for second-degree murder. Others had their charges dismissed or ultimately were not prosecuted. In Little Rock and at the headquarters of the NAACP in New York, efforts began to fight the death sentences handed down in Helena, led in part by Scipio Africanus Jones, the leading black attorney of his era in Arkansas. Jones began to raise money in the black community in Little Rock for the defense of the “Elaine Twelve,” as the convicted men came to be known.